Downers Grove, Ill. : IVP Books, c2012. What was clear to the original readers of Scripture is not always clear to us. Because of the cultural distance between the biblical world and our contemporary setting, we often bring modern Western biases to the text. Biblical scholars Brandon O&apos;Brien and Randy Richards shed light on the ways that Western readers often misunderstand the cultural dynamics of the Bible. They identify nine key areas where modern Westerners have significantly different assumptions about what might be going on in a text. Drawing on their own crosscultural experience in global mission, O&apos;Brien and Richards show how better self-awareness and understanding of cultural differences in language, time and social mores allow us to see the Bible in fresh and unexpected ways. 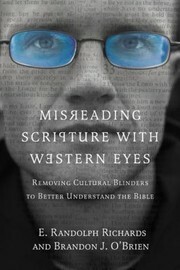 Misreading Scripture with Western eyes : removing cultural blinders to better understand the Bible / E. Randolph Richards and Brandon J. O&apos;Brien. $c Statement of responsibility E. Randolph Richards and Brandon J. O&apos;Brien. 504 BibliogEtcNote $a Bibliography, etc. note Includes bibliographical references (p. -225) and index. 505 ContentsNote 0 $a Formatted contents note Serving two masters : mores -- The Bible in color : race and ethnicity -- Just words? : language -- Captain of my soul : individualism and collectivism -- Have you no shame? : honor/shame and right/wrong -- Sand through the hourglass : time -- First things first : rules and relationships -- Getting right wrong : virtue and vice -- It&apos;s all about me : finding the center of God&apos;s will. 520 Summary Etc. $a Summary, etc. note What was clear to the original readers of Scripture is not always clear to us. Because of the cultural distance between the biblical world and our contemporary setting, we often bring modern Western biases to the text. Biblical scholars Brandon O&apos;Brien and Randy Richards shed light on the ways that Western readers often misunderstand the cultural dynamics of the Bible. They identify nine key areas where modern Westerners have significantly different assumptions about what might be going on in a text. Drawing on their own crosscultural experience in global mission, O&apos;Brien and Richards show how better self-awareness and understanding of cultural differences in language, time and social mores allow us to see the Bible in fresh and unexpected ways. 650 Subj:Topic $a Source other than LC Christianity. 700 AE:PersName 1 $a Name O&apos;Brien, Brandon J.